We may have written a few articles about common shortcut keys for various software, but it seems we missed Outlook. 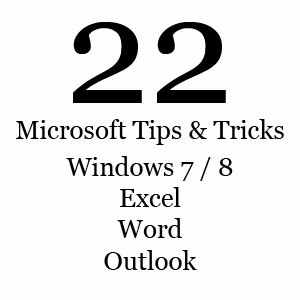 Since it is one of the more commonly used software for business email, we thought we’d take the time to share some keyboard shortcuts that will help you get around quicker, and get more out of Outlook. Here are a few of our favorite shortcuts. Note: * Denotes commonly used shortcuts for PC software. Arrow Keys: Move throughout the navigation pane. Left / Right Arrow Keys: Collapse / expand a group in the e-mail message list. ALT + . (period): Opens the Address Book with the To: field selected. ALT + B: Opens the Address Book with the BCC: field selected. ALT + C: Select message recipients for CC: field. ALT + D: Switch to Daily Calendar view. ALT + E: Open the Edit drop down menu. ALT + F: Open the File drop down menu. ALT + K: Check names in the To:, CC:, or BCC: field against the Address Book. Note: Cursor must be in the corresponding field to check contacts. ALT + L: Reply All, in an open message. ALT + M: Switch to Monthly Calendar view. ALT + R: Reply / Switch to Work Week Calendar view. ALT + S: Sends an open message. ALT + Y: Switch to Daily Calendar view. ALT + F4: Close the active window. CTRL + 1: Switch to Mail. CTRL + 2: Switch to Calendar. CTRL + 3: Switch to Contacts. CTRL + 4: Switch to Tasks. CTLR + 6: Switch to Folder list in Navigation Pane. CTLR + 7: Switch to Shortcuts. CTRL + F: Forward an item, must have a message open. CTRL + M: Send / Receive All. CTRL + Q: Mark the selected message as Read. CTRL + R: Reply to selected / open message. CTRL + U: Mark selected message as unread. CTRL + Y: Go to folder. CTRL + , (comma): Switch to the next item. Note: must have an item open to use this command. CTRL + . (period): Switch to previous item. Note: must have an item open to use this command. CTRL + Shift + Tab (or F6): Switch between the Folder List and the main Outlook window. CTRL + Shift + A: Open a new Appointment. CTRL + Shift + B: Opens the Address Book. CTRL + Shift + E: Open a new folder. CTRL + Shift + G: Flag selected message for follow up. CTRL + Shift + J: Open a new Journal Entry. CTRL + Shift + K: Open a new Task. CTRL + Shift + L: Open a new Distribution List. CTRL + Shift + M: Open a new Message. CTRL + Shift + N: Open a new Note. CTRL + Shift + O: Switch to the Outbox. CTRL + Shift + P: Open the New Search Folder window. CTRL + Shift + Q: Open a new Meeting Request. CTRL + Shift + S: Open a new Discussion. CTRL + Shift + U: Open a new Task Request. CTRL + Shift + Y: Copy a folder. Tab: Move throughout the navigation pane and reading pane in Outlook. + or -: Expand or collapse a folder or selected group in the Navigation Pane. F9: Send / Receive all. Julie Strier is a freelance writer who wants to help you use your technology smarter and faster. Email: julie@mybusinesswriter.com. Website: www.mybusinesswriter.com.